On the first day of next month, IBM CEO Virginia Rometty will add Chairman to her title, solidifying her spot atop the century-old technology and IT services giant. Big Blue made the announcement today after the close of markets in New York. IBM shares are ticking up after hours, rising to $207.32, after closing at $204.98 during the regular session. Ginni Rometty is a well-respected executive who took over as CEO on the first day of this year. She recently topped Fortune Magazine’s list of the “50 Most Powerful Women in Business,” though it was Yahoo CEO Marissa Mayer who made the cover. Rometty is generally credited with doing the heavy lifting to get PricewaterhouseCoopers Consulting fully integrated following its $3.5 billion acquisition by IBM in 2002. Earlier this year, Rometty was also an unwilling figure in a national debate over Augusta National Golf Club’s longtime policy of excluding women from memberships. The complication was that the club had always offered an honorary membership to the CEO of IBM. The stories caused a brief national kerfuffle that prompted both President Obama and Republican presidential nominee Mitt Romney to weigh in. Ultimately, Augusta changed its policy and offered memberships to two women, including former Secretary of State Condoleezza Rice. Rometty’s appointment also marks an end to the IBM career of Sam Palmisano, who will remain as a special consultant until he officially retires on Dec. 1. His tenure will be remembered for, among other things, a 125 percent increase in IBM’s share price and for the then-controversial decision to sell IBM’s PC business to China’s Lenovo. And while this is probably not the moment to bring it up, it bears mentioning that Rometty is 55, and IBM’s policy has typically been that CEOs retire around the time they turn 60. However, there’s nothing saying that practice can’t or won’t be changed. Anyway, here’s IBM’s official announcement. ARMONK, N.Y.–(BUSINESS WIRE)– The IBM (IBM) board of directors today elected Virginia M. Rometty chairman of the board, effective October 1, 2012. Mrs. Rometty succeeds Samuel J. Palmisano, who is stepping down from the board effective October 1, 2012. Mr. Palmisano will become Senior Adviser to the company until he retires on December 1, 2012. As of October 1, 2012, Mrs. Rometty’s title will be IBM chairman, president and chief executive officer. Mrs. Rometty, 55, is currently IBM’s president and chief executive officer. 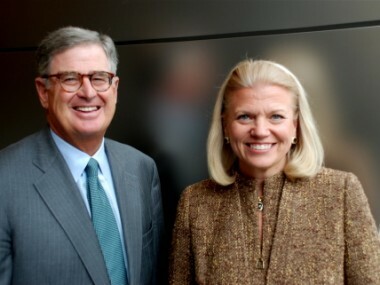 She succeeded Mr. Palmisano as IBM’s ninth CEO in January of this year, after holding senior leadership positions in IBM’s services, sales, strategy and marketing units. Mrs. Rometty led the successful integration of PricewaterhouseCoopers Consulting — the largest acquisition in professional services history, building a team of more than 100,000 business consultants and services experts. She became a director of IBM in January. Mr. Palmisano, 61, became IBM chief executive officer in 2002 and chairman of the board in 2003. During his tenure, IBM transformed its product and services portfolio, exiting commoditizing businesses, including PCs, printers and hard disk drives, and greatly increasing investments in analytics, cloud computing and other high-value businesses and technologies. He has overseen the transformation of IBM from a multinational into a globally integrated enterprise. During Mr. Palmisano’s tenure as CEO, IBM created over $100 billion of total shareholder value.